Arrest of former Director of Military Intelligence Maj Gen Amal Karunasekera hailed as breakthrough in The Nation Assistant Editor’s abduction case All things considered, former Editor of The Nation, Keith Noyahr was one of the lucky few. Abducted and tortured in May 2008 during a time when dissenting journalists were hunted with impunity, at least he made it out alive. Murdered editor of The Sunday Leader Lasantha Wickrematunge and Journalist Prageeth Ekneligoda who disappeared without a trace in 2010 and remains missing to this day, were much less fortunate. But the common factor that binds these deaths, disappearances and assaults together according to the Criminal Investigation Department (CID) of the Police is the connection of the country’s Military Intelligence to each of the cases. 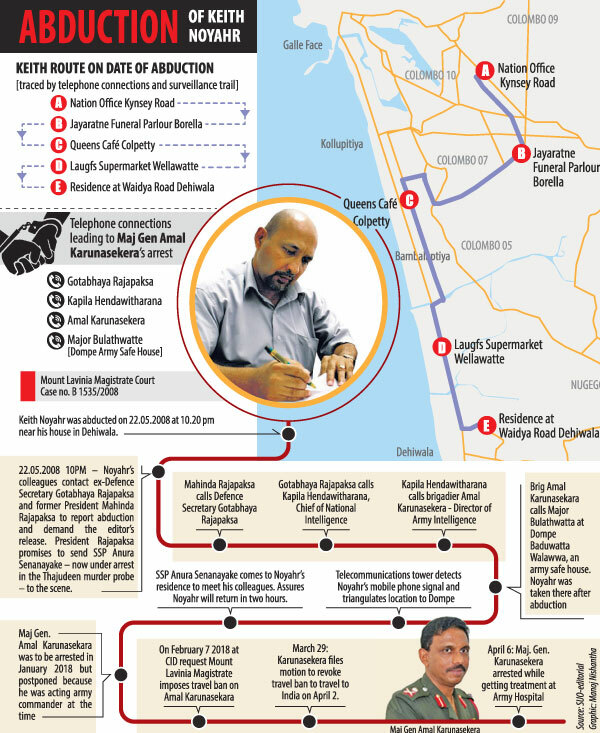 The assault on former Rivira Editor Upali Tennakoon and the abduction of journalist and activist Poddala Jayantha are also linked to the same shadowy military intelligence networks, run at the time by the country’s powerful former Defence Secretary, Gotabaya Rajapaksa.